The Small World phenomenon has inspired researchers across a number of fields. A breakthrough in its understanding was made by Kleinberg who introduced Rank Based Augmentation (RBA): add to each vertex independently an arc to a random destination, selected from a carefully crafted probability distribution. Kleinberg proved that RBA makes many networks navigable, i.e., it allows greedy routing to successfully deliver messages between any two vertices in a polylogarithmic number of steps. Our goal in this work is to prove that navigability is an inherent, robust property of many random networks, requiring no augmentation, coordination, or even independence assumptions. Our framework assigns a cost to each edge and considers the uniform measure over all graphs on n vertices that satisfy a total budget constraint. We show that when the cost function is sufficiently correlated with the underlying geometry of the vertices and for a wide range of budgets, the overwhelming majority of all feasible graphs with the given budget are navigable. 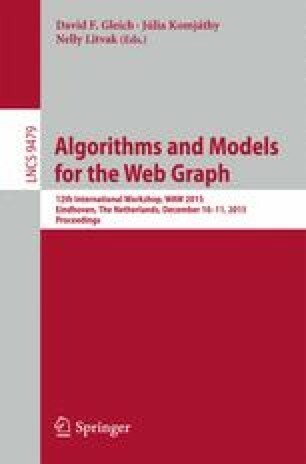 We provide a new set of geometric conditions that generalize Kleinberg’s set systems as well as a unified analysis of navigability. A longer version of this work appears at http://arxiv.org/abs/1501.04931. D. Achlioptas—Research supported by ERC Starting Grant StG-210743 and an Alfred P. Sloan Fellowship. P. Siminelakis—Supported in part by an Onassis Foundation Scholarship.